How do I search for a patent? Before rushing to file a patent, inventors should first conduct an online worldwide patent search to confirm that their invention is “novel“. The databases are freely accessible, and easy to use. In the WIPO search field, select “English Text” – this gives you the widest scope – and enter essential features of your invention (without linking words with the boolean “and”). Then, click “Search”. The aim is to reduce the number of search results to around 200. If your search returns too many results, go back to the search field and add another term. Next, change the “List Length” to “200”. After the page has been refreshed, change the “View” to “All + Image”. You will now be able to scan through 200 patents extremely quickly. 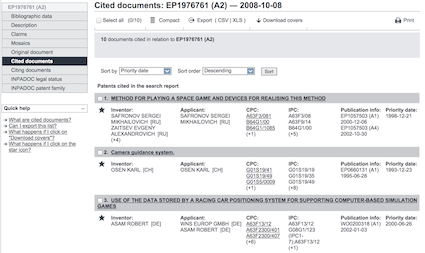 Note down the relevant patent numbers, without viewing them through the WIPO search portal. 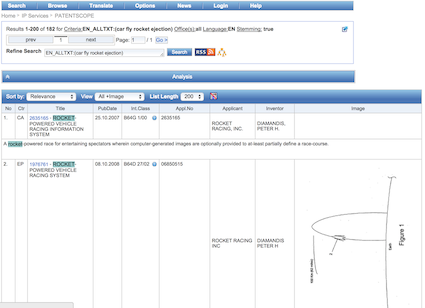 Enter a patent identified during the WIPO patent search into the Espacenet search field, then click the patent record. You can now view the entire patent document. Tip: click on “Description” in the left hand margin for a searchable version of the description. In the left hand margin, click “Cited Documents”. This will display all patents that were filed earlier than this patent, which earlier patents the examiner found to be most relevant to this patent. This will direct you to the neighbouring older patents. In the left hand margin, click “Citing Documents”. This will display all patents that were filed after this patent, where the examiner of those subsequent patents considered this patent to be relevant. This will direct you to the neighbouring newer patents. In this example, there are no citing patents. The secret is to stick to the system and not to go on a frolic, clicking randomly on citation links. You are finished when: (i) you have “knocked-out” the feature that you thought was new; or (ii) keep clicking citations without seeing new patents. Tip: Also conduct boolean searches through Google images, Espacenet, the USPTO and Google Patents. for only R3,950! Just call us to start the process.